It's not uncommon for an imaginative child who grows tired of being the same person day in and day out to take on the identity of someone-or something-else. In this whimsical tale by the team behind Christmas in the Country, a boy decides that by turning himself into an alligator, he can have more fun doing everyday things. 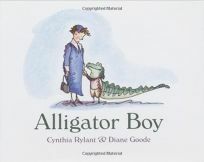 Rhyming verse carries the reader through a rather formulaic storyline as the boy tries on an alligator costume (consisting of an oversize head and tail) and presents his new self to family and friends ("" 'I hope you still like me,' the small gator said./ Dad nodded and patted the reptile's green head""). Goode's watercolor illustrations, which depict the Alligator Boy outfitted in his new ""skin,"" carefully follow the storyline to the letter; a few imaginative touches, however, are included in scenes in which the boy's human torso is obscured, making him appear to have become a complete 'gator. The boy's life improves as he makes friends easily at school and is able to defend himself from the class bully-all while dressed as an alligator-leaving readers to assume he was previously unable to do these things. Though sweet throughout, the story's end is somewhat unsatisfying, with the boy remaining an alligator and life proceeding as usual. Ages 3-7.